I once frisbied my Mum a birthday cake I had made her, it was so hard (forgot the sugar), I have absolutely nuked an apple crumble (put the grill on instead of the oven – twice in succession!) and have the proud memory of serving Beef Bourgignon to 10 people topped with biscuits (mistook puff pastry for shortcrust pastry). With two young children and a family to feed, I do try my absolute best to cook fresh, healthy meals for us all but even my daughter once asked when we were out “where are the black bits on the roast potatoes? I love the burnt bits”……and my husband actually recently admitted to peeking in the microwave every evening with “trepidation” at what he might find was left for him. So, when Box’d Fresh approached me and offered to send me a week’s supply of recipes and beautiful ingredients to feed the family in return for my honest feedback and I heard there was actual cooking involved I was excited but naturally, given my history, a little anxious. The ingredients arrived one Friday afternoon all beautifully packaged in sheep wool to keep them cool and I marveled whilst unpacking it all at how everything had been exactly pre-portioned and was so expertly presented and packaged. Literally everything (save salt and pepper) was there that I would need and there were beautifully illustrated and clear recipes to follow. Maybe, just maybe…I could actually do this. Recipe 1 was homemade burgers with sweet potato fries and I cooked everything according to the recipe. It really was so easy and turned out perfectly. Even my long-suffering husband was astounded by how delicious it was, proudly announcing “I would pay at least £12 for that in a restaurant”, before clearing his entire plate. The children ate everything too, a rare but welcome occurrence! Recipe 2 was Sichuan mixed vegetables with steamed rice which sounded heavenly and super healthy and not something on my limited repertoire that I would usually cook. Again, following all instructions, I didn’t go wrong and the whole recipe was so simple, with the meal delicious and bursting with flavour. Another happy husband – must be careful, he might get used to this…! 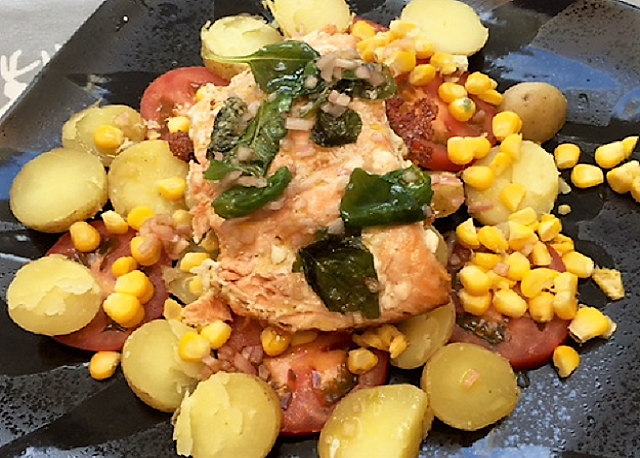 Recipe 3 was Salmon with new potato and corn salad with basil dressing which I knew the whole family would love. I struggled a bit knowing when the salmon would be cooked but followed all instructions to the letter and it was cooked perfectly. A zingy dressing made this wholesome and tasty meal a winner in our household, which I am keen to try again. Tomorrow, we are trying Sesame butterfly chicken with peanut sauce and Asian slaw and the following day a Spiced kidney bean curry. The family think they are dining out every night with these culinary masterpieces! Easy – Having literally everything delivered to my door was such a blessing. For 5 days there was no thinking about what I would cook, no planning meals, no shopping for ingredients, no scouring store-cupboards, no unloading cars, no pre-portioning out ingredients and no having to phone my Mum mid-prep to ask for help! Quick – All recipes took no longer than 30 minutes to get to the table (including preparation and cooking time) which for a busy family household is just perfect. Because I was not in the kitchen for hours, I could afford to spend more quality time with the children and really felt ‘in control’ of the mealtimes with my trusted recipes. Quality – The quality of the ingredients was also very apparent. All fruit, vegetables, meat and fish were very fresh and organic and it was clear that only the finest ingredients were being used. I have in the past been anxious to online shop with fresh items as you are never sure of the freshness but with Box’d Fresh, my fears were unfounded. Educational – All recipes were also incredibly easy to follow, each on its own simple card with required ingredients on the left, the method on the right and even a section with utensils you will need and anything additional (salt, pepper, oil). They are also yours to keep, so you can cook them again and again, thus expanding your culinary repertoires. I have since cooked the homemade burgers on 3 separate occasions, even for guests, I just tripled the recipe. 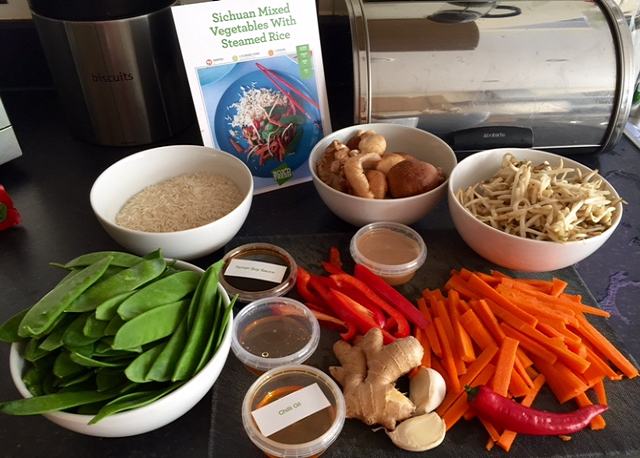 Inspiring – For me, the most important thing I found with using this recipe service from Box’d Fresh is that it gave me confidence to try to cook new foods, it taught me how to cook flavours (soy sauce and peanut butter for a quick stir fry!) 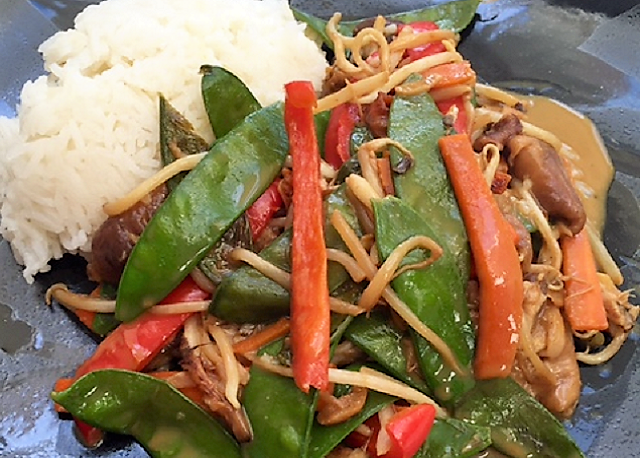 and to not be afraid of cooking with different foods, such as fresh ginger, capers, chili oil and shallots etc. Life skills and I am less reticent to give things a go now! 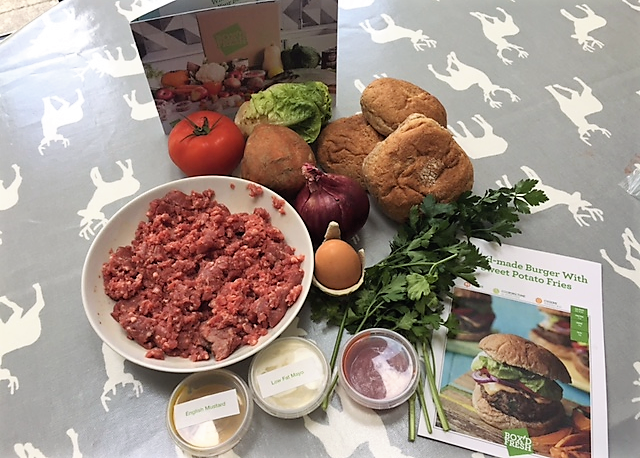 The Box’d Fresh menu plans change every week and always with a focus on healthy, wholesome and delicious meals that are effortless to cook, with quality ingredients and with globally-inspired recipes to add a twist to meal times, encouraging all the family to try new foods and enjoy them. What I particularly liked too is that you can pause or cancel your subscription at any time very easily, if you are away for a couple of weeks or want a break, just one click online and it is done. The customer service is also fantastic, all ingredients are hand-picked and boxes hand-packed with care given to fragile or delicate foods. 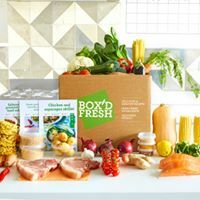 The team are swift to respond to queries/ emails, they provide great tips and the team at Box’d fresh have clearly created a winning formula in the field of meal and recipe delivery. I look forward to seeing what delicious meals they come up with next. Thank you so much Box’d Fresh for the experience, I will most definitely be trying your mouth-watering meal-service again and thank you for all those divine dinners! Box’d Fresh have kindly offered Little Bird subscribers and audience an appetising 50% off with the discount code ORDERNOW50 for 50% off your first box. Just go to www.boxdfresh.co.uk to redeem, bon appetit!